Oil is the lifeblood of any engine. It lubricates moving parts and helps to keep temperatures at a level that provide optimal efficiency and performance. Without the proper oil, or amount of oil, your vehicle’s engine would seize up rendering it useless. Ensuring you properly change your oil at appropriate times with a certified service provider can help keep your vehicle running for years to come. 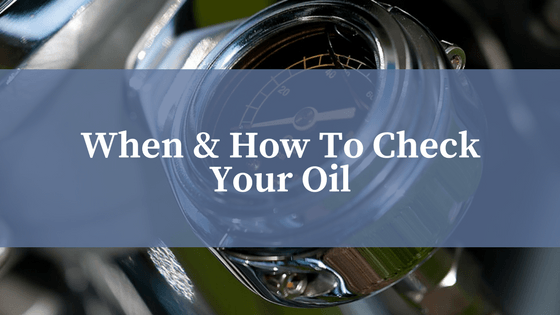 In this post we’ll teach you the in’s and outs or checking your own oil and how to properly gauge when to take your vehicle in for an oil change. Generally speaking, your oil should be changed every 5,000 km or so, while some oils can extend the duration between changes up to 10,000 km. If you experience a low-oil warning light on your dash, this means that you have very little oil in your engine and it’s time to get a change. This is the worst case scenario, and you should almost never have to worry about a low-oil light coming on if you maintain a good oil change schedule. To check your oil level, first you should drive the car until it warms up to average operational temperature. Then park it on a level surface turn off the engine and wait about 5-10 minutes to allow the oil to settle. Pop the hood and locate the oil dipstick – in newer vehicles the dipstick is bright yellow. Before you pull the dipstick out, prepare yourself with a piece of lint-free cloth or a paper towel so you can wipe the dipstick clean before putting it back. When you pull it out, you’ll find that the stick has markings near the bottom that will indicate the proper levels of oil. If the oil reads as low, consult the previous oil change sticker that’s usually located in the top corner of the windshield on the drivers side. Add a half quart of oil into the engine oil reservoir. Then wait another few minutes before checking the level again. As a general rule of thumb – dark brown or black oil means that you need a change ASAP. If it appears to be transparent and more like the colour of a weak cup of tea, you’ve still got some time before needing to swap out oil. Dealerships and specialized oil change stations can make short work of a total oil change – usually only taking about 10 minutes or so to have you on the road again. In this process, mechanics will drain the oil from your vehicle, add fresh oil, and change the oil filter located underneath the chassis. Different engines require different oils. If you run a performance vehicle, you’ll likely need a synthetic oil designed to optimize performance in high-tech engines. Synthetic oils are flow better at low temperatures and main peak lubricity at high temperatures. They’re expensive by contrast to organic oils and not every oil needs them. Alternatively, your vehicle will likely require conventional oil, the standard in most dealerships and change stations. They’re available in several viscosity levels depending on the running temperature of your vehicle’s engine. Synthetic blends are just that – oils that provide a blend of conventional and synthetic oils to address protection needs and high temperatures while keeping cost in check. Your vehicle dealership will know exactly what to put in your vehicle, but this information is also located in the owner’s manual.